52557 miles. Emerald Black metallic with full Black leather interior. Specification: 19 inch alloy wheels, front and rear acoustic parking with optional front and rear camera system, colour navigation system, cruise control, electrically operated and heated front seats, bluetooth, LED daytime running lights with xenon headlamps, radio/cd6 autochanger, polished mahogony inlays, power bootlid and so much more - typical flagship specification. Complete with full Audi main dealer service history (3 digital records) and both serviced and MOT'd on arrival. Original handbook pack and two remote keys. Find yourself behind the wheel of a used Audi A8 and you'll quickly discover what makes this premium executive saloon stand apart from the crowd. Luxurious in every detail, the A8 is Audi's flagship model. Incredibly elegant, well equipped and outstanding to drive, it's a car that demands to be noticed. 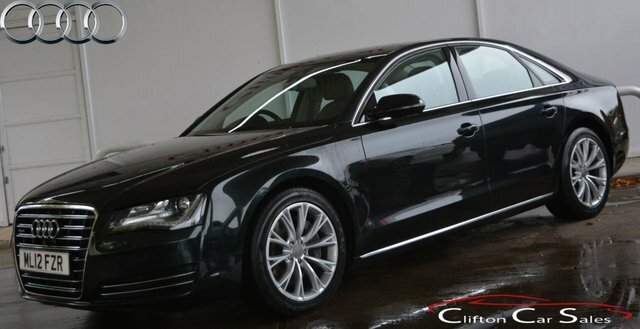 For a superb deal on a used Audi A8 for sale in Morpeth make sure you come to Clifton Car Sales. We've been helping drivers to find their ideal pre-owned vehicles for years so why not let a member of our team speed up the search for your next car. View our latest stock online before getting in touch to arrange a test drive.